Efficient Office Laptop. Lenovo combines an energy-efficient AMD APU with a matte 15.6-inch display and offers the model for 300 to 400 Euros (~$390 to $520). The end result should be a conservative, well-priced office laptop. Our review will show if this is indeed the case. 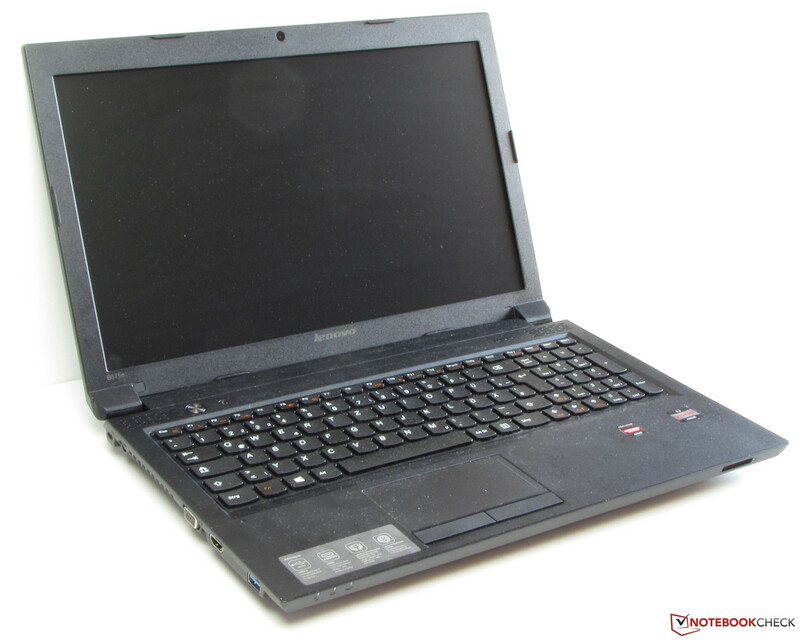 A simple and cheap 15.6-inch office laptop based on the AMD Vision platform - that is the Lenovo B575e. The price lies between 300 and 400 Euros (~$390 and $520), which places this model in a price category already filled by Lenovo and many other competitors. 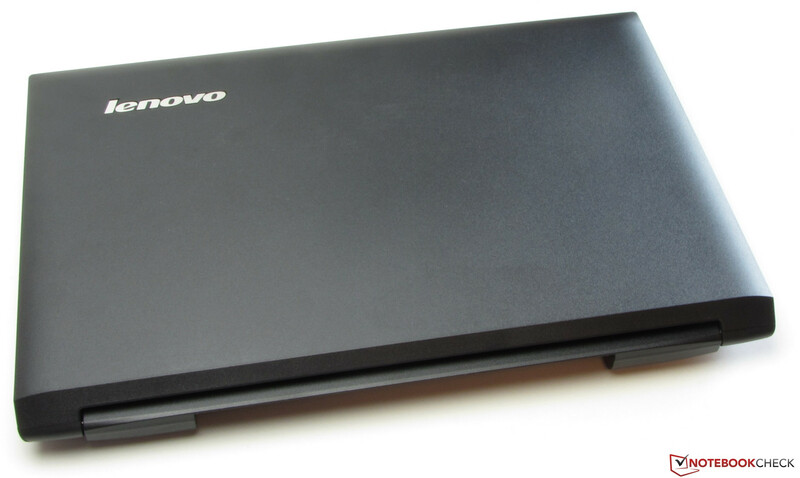 We have previously tested an Intel-based series - the Lenovo B570e. In this review, we will check to see if the B575e has what it takes to compete in this fierce market. For comparison, we use the Dell Vostro 2520 (Core i3-2328M, HD Graphics 3000) and the HP 650 (Pentium B970, HD Graphics). Both laptops are available with a basic configuration for roughly 300 Euros (~$390). The case of the B575e is the same as that of the B570e. The entire case is made of matte, black synthetic material which features a very conservative design. The cases of the Vostro and HP 650 are also entirely made of synthetic material. The sturdiness is acceptable. For example, the hand-rest region does not warp under pressure. However, the base unit can be pushed inwards if one presses down on the front edge and pressing down on the left edge next to the keyboard, will raises the front right edge of the laptop from the table. The base unit should have been a bit stiffer as it is easy to warp. The same is true for the display cover. The hinges are easy but they do a good job of holding the screen in position. Opening the display with one hand is possible. Overall, Lenovo offers a good case for this price. It exudes the quality of a work laptop. A maintenance flap is included. The B575e is the only model of the three laptops we have for comparison which offers a USB-3.0 interface. Owners of large-capacity external storage devices will be happy. The sister model, the B570e lacks an USB-3.0 interface and that is the only difference in connectivity between the two. Otherwise, all devices offer the standard ports found in laptops today. Most of the interfaces of the B575e are placed near the front on both sides, which can cause problems with cable clutter when using wired peripherals. The front sports the card reader (SD, SDHC, SDXC, MMC). The system works fluidly - as long as it is not overloaded. If multiple browser windows are open, the system runs more slowly. 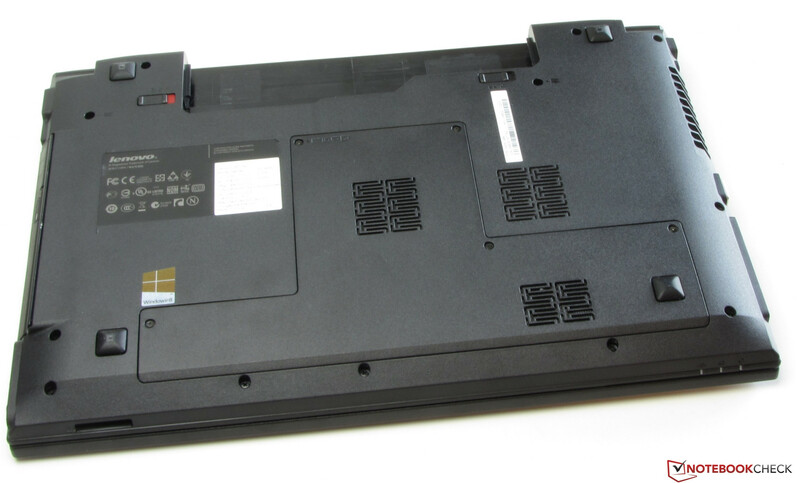 The E2-1800 APU cannot hide the fact that it is meant for netbook use. The PC Mark 7 result is at the expected level. The Vostro 2520 (Core i3-2328M, HD Graphics 3000) and the HP 650 (Pentium B970, HD Graphics) are well ahead of the B575e. The HP 655 which also uses an E2-1800 APU gets a lower PC Mark 7 score than the B575e. This is due to the faster storage device of the B575e, which has clearly better performance in the CrystalDiskMark benchmark. A Solid State Disk raises the system performance: the time for opening applications is reduced. We tested this with an old, used SSD (32 GB Corsair Nova V32; AS SSD seq. write: 176 MB/s, seq. read: 57 MB/s) which we installed in a PC. We installed Windows 7 on it and ran the PC Mark 7 benchmark. The score was slightly higher than 1600 points. This is a rise of 30% and does not affect the CPU performance of the APU. Despite the rise in performance, the system is still sluggish while multiple browser windows are open. In this specific case, the SSD does not make a difference. Lenovo uses a Western Digital Scorpio Blue series HDD in the B575e. The storage device has a capacity of 500 GB and runs at 5400 rpm. The device does not run very fast. CrystalDiskMark records a read speed of 92.53 MB/s. HD Tune records an average transfer speed of 59.2 MB/s. These are the poor values for a 5400 rpm HDD. The Radeon HD 7340 GPU of the E2-1800 APU takes care of the graphics processing. This graphics core is entry-class level and supports DirectX 11. The GPU runs at 523 MHz. The speed can be boosted up to 680 MHz (AMD Turbo Core). The 3D Mark benchmark results are at the expected level. The GPU of the Dell laptop (Core i3-2328M, HD Graphics 3000) is stronger than the Radeon GPU. However, it does keep its own against the GPU of the HP notebook (Pentium B970, HD Graphics). As shown by the results of the gaming benchmarks, the AMD APU is not suitable for running the latest 3D games. Even at low resolution and the lowest details, most games stutter on our test model. Anno 2070 runs barely fluidly. Surprisingly, a less-demanding game like FIFA 13 cannot run without stutters on the device.